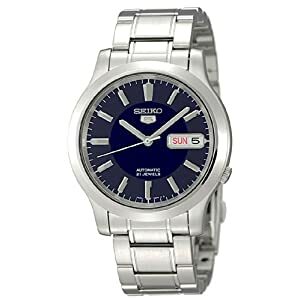 Yet another of the Seiko 5 series, this is a handsome and rugged watch, with a silvery stainless steel band and bezel. The dark blue dial has a beautiful contrast with the steel features. It has an analog display with hour, minute and second hands. The calendar shows day of the week and the date, too. The luminescent hands and numbers make it easy to see the time even in the dark. The watch uses an automatic movement and is self-winding, so it never needs a battery. It's water resistant to 330 feet. Overall it's an excellent value for its price and would make a nice present for a man.